One of the hot topic issues around starting a family and raising an infant is SLEEP, the lack of it, how to get it, and how much is necessary. When you go online to look up baby sleep schedules you are inundated with techniques on how to get baby to sleep. What I'm about to write in this post is based on my experiences, my beliefs, and is my opinion. This is what works for my family. What works for the next family may be similar, completely different, or somewhere in between, and that's OK! Co-sleeping (a.k.a. sleep sharing, bed sharing, family bed) is the practice of having the baby sleep with her parents in the same bed. This is practiced in many cultures around the world. It is not recommended by medical professionals in the U.S., but seems to have a following among attachment minded parents. Our plan was to put the Bean in her crib from the get go. We wanted her to learn the fundamental skill of putting herself to sleep from the very beginning. We had read that babies slept most of the day (19+ hours) so how hard could it be? Haha, we were so naive! A lot of how hard it can get depends on your parenting style and the temperament of your baby. Our baby cried a lot in her early weeks and my husband and I don't like to hear her cry. Three weeks into being new parents, my husband and I were sleep deprived, cranky, and felt like we were wallowing in misery even though we were so in love with this tiny little human with strong lungs. Sleep deprivation is no joke!! Just keep in mind that sleep deprivation is an "enhanced interrogation technique" used by the military. In the first few weeks, the Bean would sleep through most of the day. Getting her to sleep after her waking up was a breeze in the day time but was so difficult at night. My husband and I would take turns holding and rocking her to sleep at night, only to start the process over when she woke up the second her back touched the crib. We were so exhausted that we'd fall asleep holding her in our arms. My husband was going back to work after two weeks and I was so worried about his driving in to Downtown LA in his condition. I had observed that the Bean slept best when she was on or near us. So at 3 weeks, I took her into bed with me. That night, she slept through 4 hours and my husband got to sleep through 4 hours. Every week after that the length of time she stayed asleep got longer and longer. By 2 months, she was averaging 8-10 hours straight! The Bean likes to hear my heartbeat and smell my scent when she sleeps. It makes her feel protected and comfortable, almost as good as being in the womb! A few friends jokingly asked if we were still sleep deprived. When I told them that we weren't because we were co-sleeping they voiced their disapproval. It wasn't recommended, the baby would never leave our bed, it was dangerous, what about SIDS, etc., etc., etc. Even though our friends meant well, I did feel a little under attack for our personal decisions. What are some co-sleeping pros and cons? On the plus side, co-sleeping helps our family get sleep at night. The Bean sleeps better next to me, where if she fusses or gets hungry, she merely needs to turn her head and open her mouth without waking up! Experts say co-sleeping promotes children's independence by making them feel more secure and strengthens the parent-child bond that'll last throughout their lives. The Ask Dr. Sears website suggests that co-sleeping can help reduce incidences of Sudden Infant Death Syndrome (SIDS), although it has yet to be proven. On the minus side, co-sleeping can be dangerous if the parents are heavy sleepers or sleeping under the influence. They could roll over and onto the baby, suffocating him/her. Experts say co-sleeping prevents a child from developing their own sense of independence until much later, and/or make the transition from parents' bed to their own bed more difficult. For our family, I love helping the Bean go to sleep at night. I know there are steps I need to take to help her continue developing her independence.... but it doesn't have to all happen right now. ...I realize that we don't need to be in a big rush for anything. There are ways that you can safely co-sleep with your infant, if this is the route you choose. 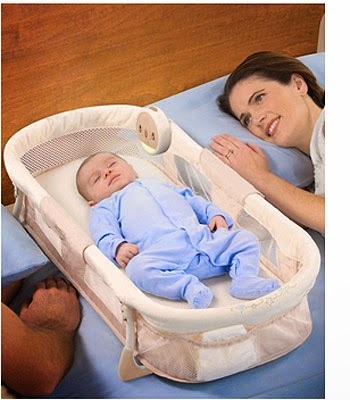 You can buy an infant co-sleeper, which is essentially a crib with one side lowered or missing so that you can put it right up to the adult bed. The baby gets his/her own little space and gets to sleep next to Mommy. There's another type of co-sleeper that lets you put baby on the adult bed. It has railings so the parents can't roll over onto the baby. It looks like a bassinet to me. There are many different types of co-sleepers out there with varying degrees of awesomeness, so enjoy the search! Another tip for safely co-sleeping: cut down or eliminate any drinking or drugs that would cause you to sleep more heavily than usual. If they can impair you while awake, they can certainly impair you while asleep. That's it for this post! I'd be happy to answer any questions for anyone interested in co-sleeping.